Comments: Evergreen broadleaf originally native to Mexico, but widely dispersed by man in prehistoric times. 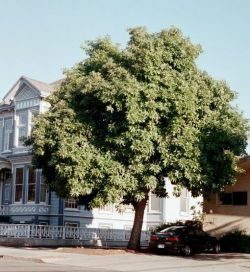 Large dark green leaves, gray rough bark, and pear shaped fruit with large seed. Planted throughout coastal California from San Diego to San Francisco. Mature trees to 60'. Most varieties not frost tolerant--expect die-back in cold weather.